Last weekend I attended the Adelaide leg of the Monster Fest Travelling Sideshow, a film festival dedicated to screening independent films in theaters that you may otherwise never see them in. I booked two screenings, one was to 78/52, an informative and entertaining documentary on the infamous shower scene from Alfred Hitchcock’s masterpiece “Psycho”, the other was to Gerald Rascionato’s debut feature-length Drama/Thriller, “Cage Dive” (not sure where the Open Water title comes from, probably a distributor request). 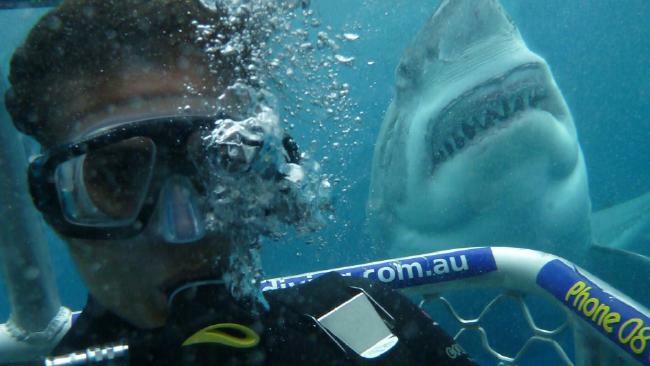 Cage Dive is a South Australian made shark film about three Americans on vacation, who are looking to put together a crazy audition tape for an extreme reality TV show. 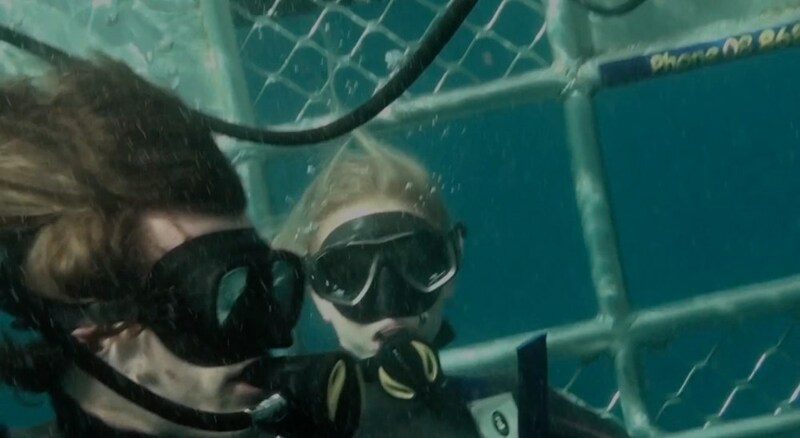 Brothers, Jeff and Josh Miller (played by Joel Hogan and Josh Potthoff) along with Jeff’s girlfriend, Megan (Megan Peta Hill), decide to take part in a cage dive at Port Lincoln, only to find themselves stranded in the shark infested waters. The film also stars Pete Valley, Mark Fell and Christopher Callen. Lately there’s been a real resurgence in the shark sub-genre, with impressive entries like Johannes Roberts “47 Metres Down” and the wider identified “The Shallows”. 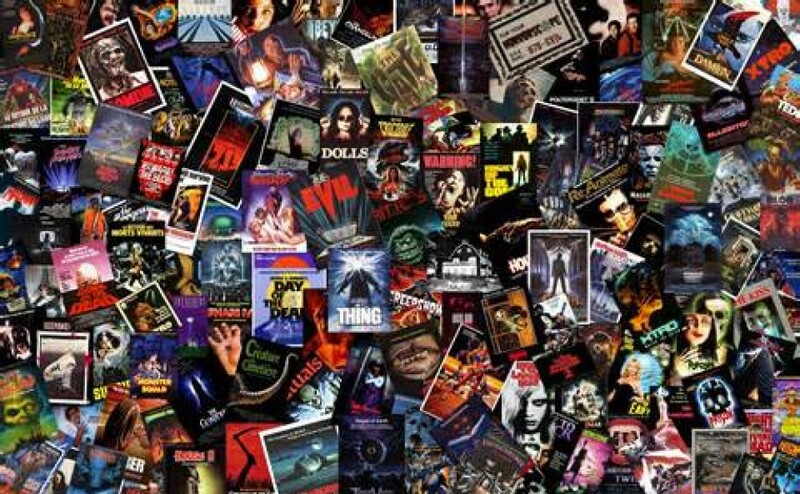 I’ve always been a pretty big fan of the genre, everything from the cheesy SyFy channel B movies like “Sharknado” and “Sand Sharks” (just to name a couple) all the way through to the bigger budget films previously mentioned. 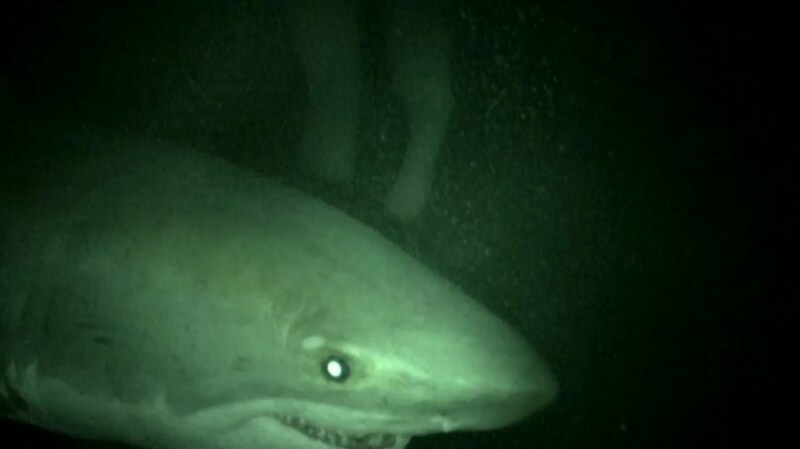 I think “Bait” is the latest Aussie shark film and that came out back in 2012. While not the greatest film in the genre, it did have a well established story and colorful characters, not to mention, it delivered on the kills and the gore which is what fans want. Rascionato’s script plays things surprisingly straight, there’s not a lot more to it than the survival aspect and I think that’s perhaps why it’s garnering more attention from fans and critics than most of these films do. Think of “127 Hours” or the far lesser known “Scenic Route”, only it’s set in water. I would have said 2010’s “Buried” but man… that’d be an insult given how mind numbingly boring that film was. Cage Dive manages to tap into that base line fear we all have (or at least I do) about being in a life or death situation. The film is nicely paced, and both the sharks and the stock footage are well-edited and far better than most films in the genre. The image below is of a superb visual fx sequence in what is ultimately a low-budget film. Color me impressed. The cinematography in Cage Dive is surprisingly good given the audience is meant to be watching found footage from the trios trip. There’s only a small dose of shaky cam and even when things do go south during the dive, nothing feels harsh. I think this is the first time in the shark sub-genre that I’ve seen a first person approach used instead of the conventional method, it no doubt helps put you in these guys shoes. Budget may have been the sole reason for shooting it like that, but either way, it works. Most of the movie takes place during the day but I was interested to see how Gerald would go transitioning with the situation once nightfall came. Utilizing minimal night vision, he’s able to show us enough of what’s going on in order to help maintain tension in the group. There’s not a lot of action in Cage Dive, but when it does rear its fin (see what I did there) the attacks are swift and violent and might just have you questioning how they pulled this all off practically. Our three leads, none of whom have a lot of experience, end up turning in pretty solid performances. Each are perhaps a little reserved at times throughout the film, but personally I’d rather see that than clear over acting. I think Pete Valley, who plays cousin Greg, probably has the most raw ability of anyone in the film and makes his limited screen time really count. The Newton Brothers score is probably the one creative aspect of Cage Dive that slightly underwhelmed, which is a surprise to me because they’ve scored a lot of really good films such as, Mike Flanagan’s “Hush” *see review* https://adamthemoviegod.com/hush-review/ and Wayne Kramer’s, “Pawn Shop Chronicles” *see review* https://adamthemoviegod.com/pawn-shop-chronicles-review/. The score is okay but it doesn’t necessarily further the viewing experience like some of their other arrangements have. Overall I was pleased with the quality of the audio track, considering ninety percent of the film takes place outside or in water. My only complaint is that on occasion the dialogue is muffled while the characters are in the water. I figure it’s because microphones and equipment are being protected and were covered in plastic. There are a few flat spots in the acting, and if you’ve got a good ear you’ll be able to pick the irregularities in their American accents. Writing the core characters as American was probably smart though on Rascionato’s part, especially from a marketing point of view, but in hindsight, it wasn’t an essential detail. I enjoyed most of the films specifics, right up until the flare incident. I understand that tensions run high, personalities clash, but it really wasn’t necessary and I think you’d be a lot more diligent about your resources and how you use them in that situation. In addition, there’s some offbeat dark comedy between the brothers shortly after that transpires and it took me out of the film momentarily. I first heard about Cage Dive almost a year ago, and after discovering it was locally made, I wanted to check it out. Rascionato’s debut feature-length film combines the survival element of fellow Aussie thriller, “The Reef” with the dramatic undertones of the aforementioned “Bait”, resulting in a realistic and terrifying setting to a shark film. It’s well shot, nicely paced and the shark footage looks superb, as do the touches of vfx work. Even though I didn’t warm to the characters all that much, I still enjoyed the performances and most of the stories developments. The soundtrack isn’t anything to write home about and the attempted humor sort of comes out of left field. There’s a few disparities with the accents and certain decision-making, but the latter probably partly due to the heightened situation the trio find themselves in. 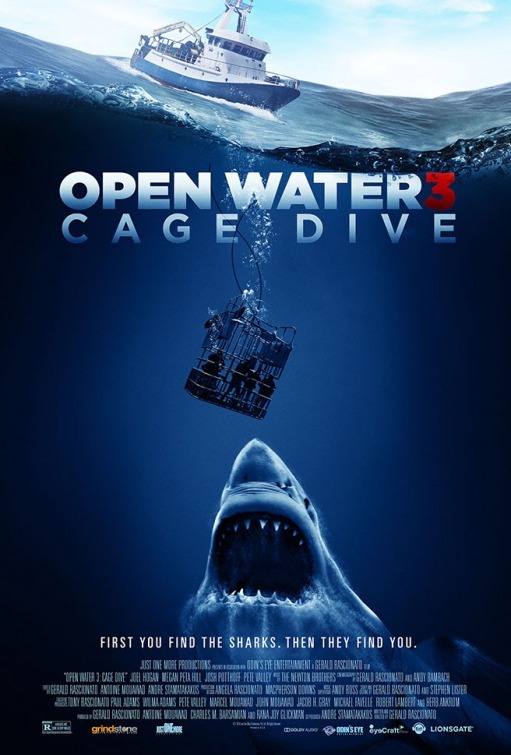 Cage Dive is a better paced and more entertaining film than “The Reef” and it’s another positive entry into the shark sub-genre of Horror/Thriller. Keep an eye out soon for an official release date from Lionsgate and check out the trailer below!